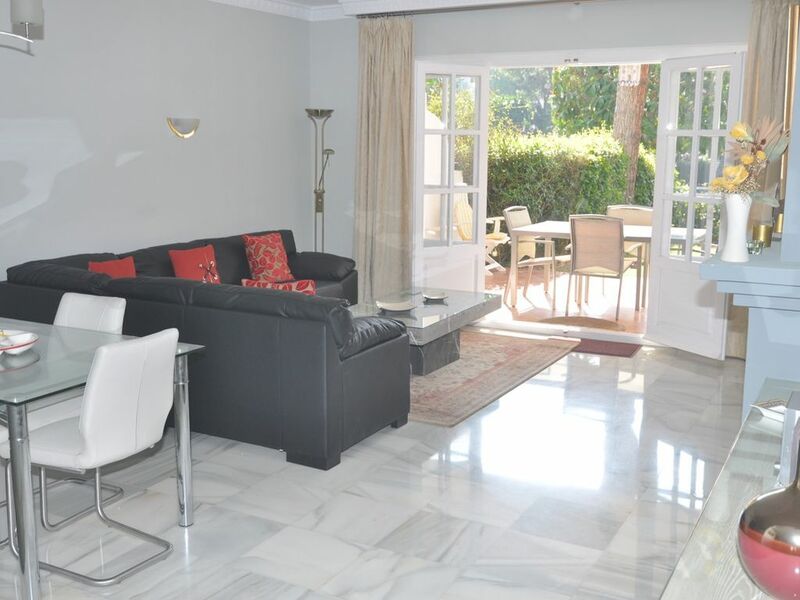 Our wonderful air-conditioned/heated ground-floor apartment is located in the original phase of El Presidente, with direct & close access to the Blue Pool from its south-facing private terrace (with dining table & sun-loungers) and garden. It is also located close to the pool that is scheduled to be heated throughout the winter (although please note that we have no control over this) and also the main lagoon pool and children's paddling pool. Recently redecorated and refurbished to a very high standard, it is very spacious (180 m²) having a large & comfortable lounge, dining-table, 48' LCD satellite television (with numerous English, Irish, Nordic, German, French, Russian and Spanish channels), DVD and Hi-Fi. Leading off from the hall are the two lovely bedrooms, one with a very comfortable king-size bed, 32' television & spacious en-suite bathroom with a large walk-in shower and the second with twin beds, 32" television and en-suite bathroom with bath/shower. There is also a very well-equipped and refurbished fully-fitted kitchen including washing-machine, dishwasher, oven, hob, fridge-freezer and microwave. We also have three bedroom apartments available in El Presidente. Our luxurious and spacious beachside complex has five swimming pools (1 is scheduled to be heated throughout the winter although please note that we have no control over this) and a young children's paddling pool, extensive sub-tropical gardens and water gardens, 4 tennis and 2 padel courts, a basketball court and a football pitch and is within close walking distance of the beach (where there are 2 beach-bar restaurants), nearby shops (including an ALDI supermarket) and many excellent restaurants. We have a cot and high chair available for our guests. The complex has 24hr monitored security and also lifeguards during the high season. There are at numerous golf courses in the surrounding area, many of which are of an extremely good standard. Skiing is possible in the Sierra Nevada near to Granada which is about a three hour drive away. In the surrounding area there are many family oriented activities available including adventure, wild-life and water parks, sea-life centres, dolphin area and water sports centres. Please contact us for details of our own website which contains a great deal more information and photographs. Exploring the local area: Marbella is an ideal base from which to explore the surrounding area. As well as the nearby coastal towns of Puerto Banus, Mijas, San Pedro and Estepona, it is well worth venturing inland to visit the beautiful white-walled towns of Benahavis and Casares. Slightly further afield is Malaga which should not be overlooked as its pedestrianised old quarter has a labyrinth of streets and squares which are great fun to explore, as well as being a very good place to buy shoes at remarkable prices! Also within easy travelling distance are the wonderful cities of Granada, Seville and Cordoba, and of course just along the coast is the island of Gibraltar with its apes, caves and tax-free shopping! Please let us know if we can help to arrange your taxi transfers to and from the airport with our wonderful local driver who speaks english and charges significantly less than that at the airport. Our KENT apartment overlooks the lovely Blue Pool from its south-facing private garden and is only a 300 metres walk along a flat pathway to the beach and our closest beach bar restaurant. The apartment has very efficient warm / cool air heating / air-conditioning. During the cooler months, duvets are provided and in the summer a top sheet and bed covers are provided for each bed. It is a feature fireplace that adds character to the room but due to fire concerns, it is not suitable for guest use. There are plenty of free parking spaces on the perimeter of our complex, the closest being just 20 metres from the apartment. There is a 48" television in the lounge and a 32" television in each bedroom. The television in the lounge is connected to the router and has over 200 television channels including those from the UK, Ireland, France, Germany, the Nordic countries, Russia and of course Spain. There are 5 Communal Pools in El Presidente, one of which is scheduled to be heated throughout the cooler mont. Our KENT apartment opens directly to the Blue Pool from its south-facing private garden. As well as being a spacious apartment, it also has the significant advantage of a large terrace which is 36 m², excluding the private garden, thus making it like an external room with its four seated dining table and two sun loungers. The apartment is also close to the pool that is heated for most of the period from October to May. There is also a DVD player available, with satellite televisions in both the lounge and the two bedrooms. Very good quality bed linen and towels for the bathroom are provided. A children's play area with swings and slides and a small football pitch is close to our beach. Free parking is available around the complex. We would thoroughly recommend this apartment. We stayed in Peter’s "Kent" property for 3 weeks. The standard of furnishings and facilities overall was very high making the apartment a real home from home. The kitchen was fully equipped, with no need to eat out when we preferred to stay in as everything we needed was on hand. Peter and Sylvia were wonderful hosts. We were welcomed with a selection of drinks, tapas and buns, followed by a quick tour of the apartment and urbanisation. They were available during our stay (they also live at El Presidente) for any queries or advice, though were never intrusive. Any small problems we had were promptly dealt with. This was a good base from which to explore the area - we had day trips to local resorts and a few longer excursions to Ronda, Cadiz, and Antequera. Thank you very much for your extremely kind review and positive comments about our apartment, ourselves and oururbanisation. It was great pleasure to meet you both and hope that we will have another opportunity to welcome you to El Presidente in the not too distant future. Nous avons passé 3 semaines en vacances dans cet appartement. Notre impression générale est moyenne, en raison de fausses représentations. Le lit est un lit Queen et non un king...la piscine chauffée, si vous aimez une piscine chauffée à 70 degrés, de plus on nous avait dit qu'il y avait le wifi...il faut aller dehors devant l'appartement des propriétaires afin de pouvoir le capter. Nous avons eu accès au terrain de tennis environ 5 jours après notre arrivée. Au début, nous pouvions capter plus de 100 postes télé, mais après 1 semaine, il ne restait presque plus rien de disponible. Le grille pain a sauté durant notre séjour et jamais remplacé. Nonobstant tout cela, l'appartement est très propre et spacieux, bel environnement, calme et très bien situé. Il vous faudra une voiture pour vous rendre dans les villes avoisinantes. Although we are pleased that you did like our apartment (as also experienced by our other guests), we are very concerned by some of your comments, especially as we do try to avoid any false impressions. We do wish you had chatted to us about them before you left as whenever we spoke to you, you always seemed very happy. With regards to your points, some were outside of our control. For example, with the television stations. During your stay, the whole of southern Spain lost their UK Terrestrial channels as they were switched to a different satellite. Only now, four weeks on are some alternative options being offered to communities like ours on the Coast. As far as the Heated Pool is concerned, the ambient night time temperature was frequently extremely low during your stay. As a consequence one of the heat exchangers broke down and is still being repaired. Once again, this was outside of our control. Indeed because of the cold nights we can have here in winter and the effect this can have on the water temperature of an outdoor pool, we do specifically say that the pool is only heated for part of the winter (and that's when both heat exchangers are operational). As a point of interest, it was decided this week that our Community is now going to use geothermal energy to heat the pool instead and this should be operational in two weeks time. Consequently in future, we should have much greater consistency in achieving a water temperature of 28C. Regarding the Community's Tennis Courts, as we explained to you, these had not been locked in the past. When we found out that this was no longer the case (because non-residents had been making use of them), we obtained a key the next day from the administrator for you to keep and use whenever you wanted. Regarding the Wi-Fi, on our page here we clearly state: "Just a very short distance from the apartment, we have created a wifi area where it is possible to access the internet for free". Regarding the toaster, I have just been to the apartment and it seems to be working perfectly so possibly there is an intermittent fault ! Regarding the bed, it is 152 cms wide which here in Europe is regarded as a king size bed. I do hope that you will accept our apologies for any inconvenience that you might have experienced during your stay here, as we do strive to be as honest as possible with all of our guests and definitely do not wish any false impressions to occur. We have just come back from a week in Andulucia and have had a wonderful trip. The apartments rented out by Peter and Sylvia are exceptional! The location is stunning and wonderful for a relaxing and romantic get-away from it all time. If you want night-life and shopping, Puerto Banus and Marbella are close by but when you require peace and privacy, then look no further that El Presidente apartments. The accommodation is of superior quality and is equipped with everything you need. We didn't need it but the apartment rental includes air-conditioning and satellite TV. The beach is a two minute walk but the beautifully landscaped complex boasts three swimming pools (one of which is heated) and tennis courts anyway. Due to the amount of apartments built in El Presidente, I cannot imagine that the surrounds would ever get too crowded either. The apartment was lovely and really well maintained with everything you need. The pools in the complex are very nice with a lot to choose from. El Presidente is quiet and relaxing but benefits from being close to a wide range of restaurants within a few minutes walk. The surrounding areas including Puerto Banus, Marbella and Ronda are well worth a visit and again the location of El Presidente makes it an ideal base for seeing the area. We had a great time at El Presidente in late September 2008. The ground floor Yolanda apartment was just like a home from home, and it was in a great location just beside the main pool. Peter and Sylvia were very friendly and we took up their restaurant recommendations which were spot on. We would definintely go back for a very relaxing holiday. Bonjour à tous, Nous sommes partis chez Peter et Sylvia début septembre, et nous avons été enchantés par notre séjour. Tout d'abord, ces personnes sont des gens charmants et très accueillants. Concernant l'appartement et la résidence, rien à redire, tout était parfait! La résidence était magnifique avec ses 5 piscines et ses allées arborées! Les piscines sont propres et la résidence très bien entretenue (des jardinier étaient là tout les jours). L'appartement était vraiment génial! Très bien décoré, bien équipé, propre… et au bout du petit jardin privatif un accès à la plus grande piscine de la résidence! Je vous recommande donc cette location qui est vraiment superbe! El Presidente, where we also live, is a wonderful beach-side complex situated on the Marbella 'New Golden Mile' and generally regarded as one of the best complexes on the coast. We are ideally located away from the turmoil of Puerto Banus and yet it is just an easy five-minute drive along the coast road that separates us. Indeed it would be impossible to find a more spacious and luxurious complex at this price anywhere along the coast and certainly not in Puerto Banus or Marbella where they are much more compactly built. We are also ideally placed to access the numerous nearby leisure and sporting facilities and to visit the nearby coastal towns of Marbella, San Pedro and Estepona, and the inland towns of Ronda, Casares and Benahavis (just ten minutes away and with excellent restaurants!) as well as the wonderful cities of Granada, Seville and Cordoba. Within a short walking distance from the apartment is the beach and two beach bar restaurants as well as an ALDI supermarket, bars and many excellent restaurants. Golf: We are just a few minutes drive from the following clubs: El Paraiso, Guadalmina, Atalaya and Flamingoes Golf; 10 minutes from Marbella Club, Monte Mayor, La Dama de Noche, Las Brisas, Aloha, Los Naranjos, La Quinta and Estepona; and thirty minutes from Valderama and San Roque. A discount is available for stays of over two weeks outside of the high season. Please contact us for our best rates for an extended stay. Included in the rate is the first €40 of electricity per week which for 99% of our visitors is more than sufficient!